KARL STORZ 50200ET. OPTICAL DISSECTOR. FENESTRATED SPATULA, SHARP (SMALL). VERY LOW PRICE POINT. "The sale of this item may be subject to regulation by the U.S. Food and Drug Administration and state and local regulatory agencies. REF # 28204CA. Manufactured from high quality Germangrade stainless steel. EXP Date: Reusble. If you are purchasing more than one item from us. You are buying a used lot of IMS 7 Gouges, 6 Curved up and 1 reversed. All in great working condition. The sale of this item may be subject to strict regulations by the U.S. Food and Drug Administration and state and local regulatory agencies. New ListingKarl Storz 495NE Lightsource cable - Warranty. Storz 495NE Lightsource cable. NorthBay Networks Inc. The sale of this item may be subject to regulation by the U.S. Food and Drug Administration and state and local regulatory agencies. This sale is for one used Storz E3839 Troutman needle holder. Here’s aSTORZ E649 Gills-Welsh Lens Loop with Olive Tip in like new physical and fully functional working condition, one owner. Listed as used but if ever used it couldn’t have been much if at all. Left and right units. "The sale of this item may be subject to strict regulation by the U.S. Food and Drug Administration and state and local regulatory agencies. FDA REGULATION AND CERTIFICATION. Anne Miller-Schlenk. YOU ARE PURCHASING A Karl Storz 28378 CH Olsen Cholangiography Clamp Surgical 6c. Silcut 2.7 UP 15 Degrees Punch. Karl Storz 28171 BC. X3 Storz E2514. x1 Storz E2523 (Missing Locking Nut). x1 Storz E2520. (Location:GDWN). "The sale of this item may be subject to regulation by the U.S. Food and Drug Administration and state and local regulatory agencies. This sale is for one lot of six, used, Storz E548 Tyrell iris hook, E549 iris hook, E588 Green Strabismus hook flat 7mm wide hook, E593 Von Graefe hook Strabismus hook, E600 Stevens curved tenotomy hook, E602 Hardesty tenotomy hook. "The sale of this item may be subject to regulation by the U.S. Food and Drug Administration and state and local regulatory agencies. " THE SALE OF THIS ITEM MAY BE SUBJECT TO REGULATIONS OF THE US FOOD AND DRUG ADMINISTRATION AND STATE AND LOCAL AGENCIES. Condition is Used. Shipped with USPS First Class Package. The sale of this item may be subject to regulation by the U.S. Food and Drug Administration and state and local regulatory agencies. So any other details would have to be answered by the manufacturer based on the serial number and or part number we are providing. STORZ Long Resection Set 30° & 70° Rotating 28 Fr. All included for a complete set as seen in pictures. Great set ready to use. "The sale of this item may be subject to regulation by the U.S. Food and Drug Administration and state and local regulatory agencies. Item is used in good condition. Ref- N4240. All products are sold “as is”, “where is”, “untested”, unless otherwise stated. All international sales are final. Single action atraumatic jaws. Axial handle. The sale of this item may be subject to strict regulation by the U.S. Food and Drug Administration and state and local regulatory agencies. Regulation / Certification. 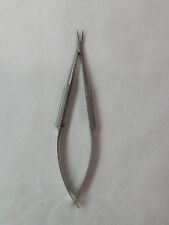 REF # 8383.52 (1) Serrated Needle Holder. "The sale of this item may be subject to regulation by the U.S. Food and Drug Administration and state and local regulatory agencies. In Very Good Condition! Karl Storz 27026UA with 27026UO Obturator. Warranty. Hours of Operation NorthBay Networks Inc. This sale is for one used Storz E3720 Wells Enucleation spoon. 21mm wide, curved spoon with 5mm x 10mm notch. 147mm overall lenghth. Double Action Jaws 40cm - WARRANTY. The sale of this item may be subject to regulation by the U.S. Food and Drug Administration and state and local regulatory agencies. Hours of Operation So any other details would have to be answered by the manufacturer based on the serial number and or part number we are providing. Model #26173 ES. Karl Storz Scissor with Serrated Blade - Laparoscopic, Excellent condition. The sale of this item may be subject to strict regulations by the U.S. Food and Drug Administration and state and local regulatory agencies. "The sale if this item may be subject to strict regulation by the U.S. Food and Drug Administration and state and local regulatory agencies. So any other details would have to be answered by the manufacturer based on the serial number and or part number we are providing. The sale of this item may be subject to regulation by the U.S. Food and Drug Administration and state and local regulatory agencies. The sale of this item may be subject to regulation by the U.S. Food and Drug Administration and state and local regulatory agencies. Hours of Operation So any other details would have to be answered by the manufacturer based on the serial number and or part number we are providing. This is for a Storz Surgical 5-1/4in (13.3cm) Straight Barraquer Needleholder W/ Lock E3828SW. REF # E3828SW. "The sale of this item may be subject to regulation by the U.S. Food and Drug Administration and state and local regulatory agencies. For this, we are highly appreciative. Storz E3839X Troutman Curved Needle Holder 10mm, Medium, Locking, 4.8"
"The sale of this item may be subject to regulation by the U.S. Food and Drug Administration and state and local regulatory agencies. Overall Length: 4.8“ / 12.2 cm. You are buying 1 very lightly used Storz #10970BE. In Excellent condition. The sale of this item may be subject to strict regulations by the U.S. Food and Drug Administration and state and local regulatory agencies. Karl Storz 495NE Lightsource cable - Warranty.